(TRR) Ohana means family. It doesn’t matter what genre of music, family is family. 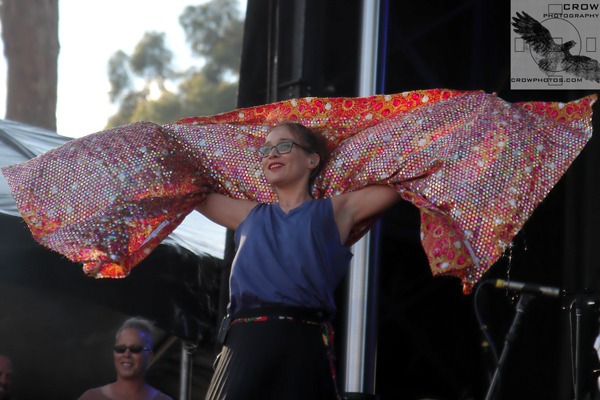 Whatever your musical influences are, they pour out from the mind to the body and the soul. The 2017 Ohana festival family was a unique blend, full of character and global sounds. This year’s second annual Ohana Fest showcased several generations of artists from all ages and styles, ranging from a grandfatherly English crooner to a teenaged one-man band. 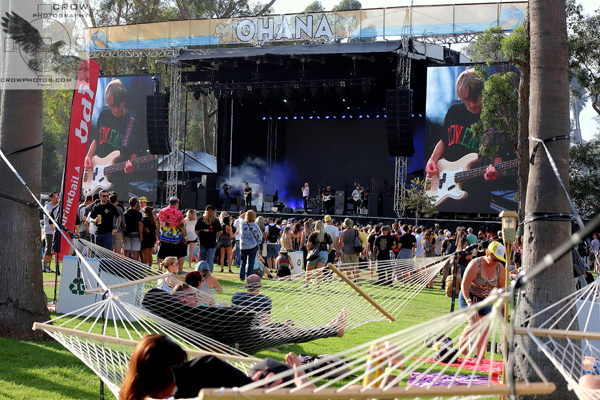 Ohana Fest brought the family together and this theme was pretty consistent throughout the festival with artists performing songs about life, love, friendship and acceptance in a free world. The festival was held at Doheny State Park in Dana Point, California, a beautiful setting right on the beach. To add to the family feel of the event, the park had plenty of grass space and a hammock area to chillax and take in the ocean air while listening to the soulful music, which is all so good for the mind and body. Vendors including Swatch, Angry Orchard, and Volcom – a local Orange County based company – also added to the fun by having interactive booths and giveaways. Swatch had a surfing video game with real boards, and a tribute to the women’s surfing championship event being held at local surf spot, Trussels, by offering a commemorative watch for sale. They even provided a cell phone charging station, which was a big hit for festival goers as batteries ran low. Angry Orchard had an adult arcade and photo booth, in addition to a silent auction. Volcom gave away cool tote bags to promote California’s recent sustainability efforts. There was a separate VIP area, which made it extra special for those who wanted to go above and beyond. 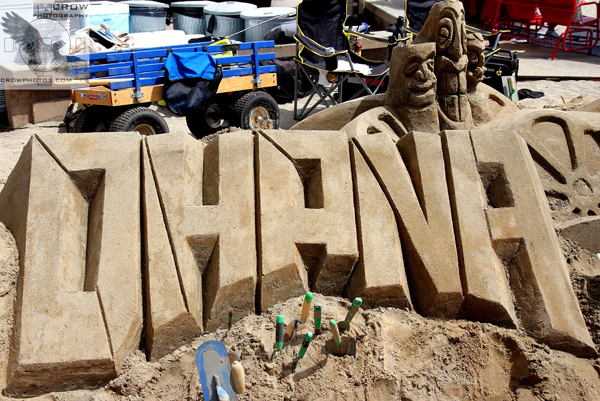 And, lastly, there was an awesome sand castle, which showcased Bai and was a work in progress being built over the course of the festival, adding to the sweet and salty ocean vibes. The Ohana festival is not only about music and art, but includes ocean awareness, cultural exhibits, craft drinks, artisan food and more. Like last year’s inaugural event, the proceeds and fundraising went to the San Onofre Parks Foundation, a non-profit organization that works with the California State Parks to develop, preserve and enhance the experience of California’s coastal parks and to the Doheny State Beach Interpretive Association. Other ocean minded non-profits at this event included the Wyland Foundation and the Ocean Institute. Eddie Vedder, founder and star of this event, and the event promoters did a great job curating the daily lineup and vendors. Ohana Fest featured artists from across the globe, Nicaraguan rum, international and local craft beers, American whiskey, Mexican tequila and American organic vodka. With the variety of drinks and artisan foods, it was truly a global event at the beach. One food vendor showcased a waffle cone with maple chicken, which was not only genius to easily eat on the go with one hand, but delicious and a fun take away meal idea to bring home to the family – the kids, young and old will love it! 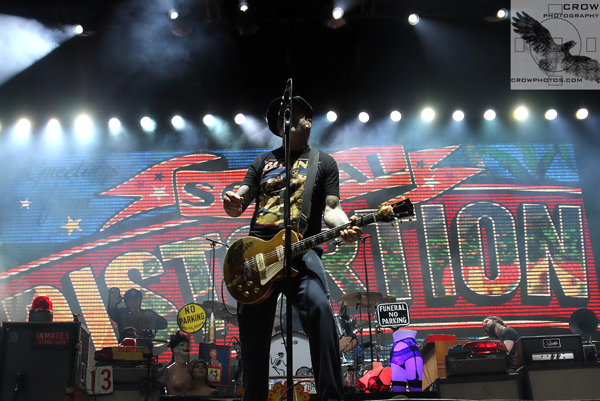 The festival featured 25 artists on two stages, with headliners Social Distortion, Eddie Vedder and Jack Johnson. 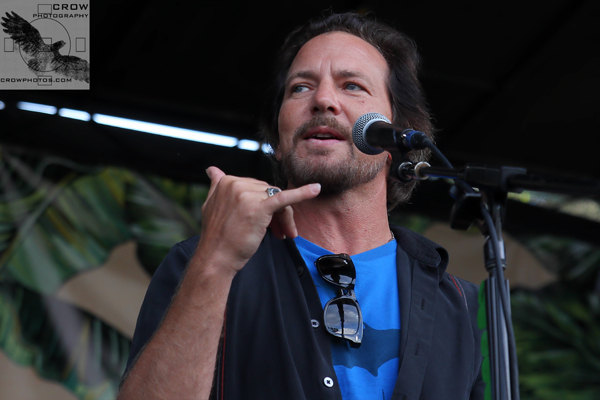 Eddie Vedder also joined various artists onstage throughout the festival for special collaborations. Eddie’s special message at his performance was “It’s not politics – it’s about love” which was a them echoed by many of the artists during their sets. It all came together clearly during the encore of Eddie Vedder’s Saturday night set, with artists from aound the world joining in for a stirring rendition of “Rocking In The Free World”. This was a multi-generational lineup, giving fans a chance to experience artists they had not seen in years, never seen before, or never even heard of. All brought their own style and passion, and all made a connection with the audience. Word at the beach was that this 2nd annual festival was significantly improved from last year’s inaugural event. Festival attendees Dustin and Sandy from Sacramento were excited to attend this event as they had such an intimate experience with Eddie Vedder last year. There was not a dry eye in the audience by the end of it. By the second and third song you could hear a pin drop, it was so quiet as everyone was hung up by every word he said, singing along and crying. It was Dustin’s first time seeing Eddie live and it felt like he met God on this earth…like he had heard God’s voice for the very first time. For both of them, the show was phenomenal. But they felt that for the first event, the setup was less than ideal. The food was in a small cul de sac area and ran out early on, with long lines and options disappearing before you had a chance to order. Despite the challenges, they were back for more and thrilled to see that the festival made the needed changes, which showed them that the organizers paid attention and cared about everyone’s experiences. As long as they keep the event going, they will keep coming back. Tagged Eddie Vedder, festival, haim, jack johnson, Missio, Ohana Dana Point, pixies, Ray LaMontagne, social distortion, The Naked and Famous, The Ohana Fest, TV on The Radio.